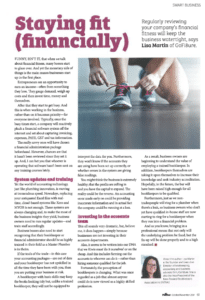 Regularly reviewing your company’s financial fitness will keep the business watertight, says Lisa Martin of GoFi8ure. Funny isn’t it, that when we talk about financial fitness, many bosses start to glaze over. And yet the monetary side of things is the main reason businesses start up in the first place. To read the GoFi8ure’s article which has been featured in the October/November 2017 NZ Plumbers magazine – click here to read it.